Because I can’t help myself, I got off my bike and asked the cop parked here, who was reading the New York Times, why he was parked in the middle of the walkway. He informed me that cyclists were going 40mph down the Manhattan approach and that parking there slows them down. When I noted that a Tour de France cyclist would have a hard time going 40 mph down the Alps and that forcing peds and cyclists into the narrow space was dangerous his window went back up. Eyes back to the day’s news. Sad. If New York had more officers on foot and bike patrol and less ingrained windshield perspective, maybe it wouldn’t come to this. 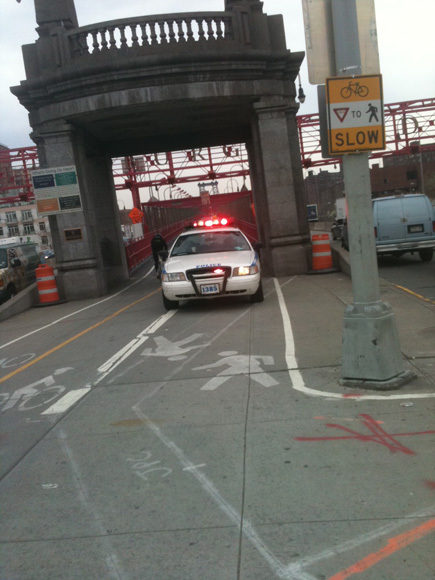 A cop using his squad car to squeeze pedestrians and cyclists into conflict, in the name of safety, oblivious to the cars hurtling off the bridge a few feet away, into one of the city’s most notorious deathtraps. The wrong way to go about this. Yet the cyclist do barrel down the bridge. When you mention that maybe they should slow down, the responses are usually not for sensitive ears. Seriously, are there bike police in NYC? Out west there are tons of them, and they are very effective. They can chase people through parks, sneak up quietly, get through traffic jams, and the cops like the assignment. There are tons of cops who get in really great shape on the job and then race on the weekends. If cops were in the position of getting doored, I imagine things would change. I once met a NYPD diver who rides 40 some miles each way from the burbs, but he’s not a beat cop. Cops like that assignment? Can you imagine trying to get a NYC cop to do ANYTHING that requires any actual effort? and on a bike? It’s a good point. For a while, at least on the UWS, there were a few NYPD officers on bicycles, at least during the summertime. What happened to them? I feel like the 90’s tv show “Beach Patrol” made it impossible for cops to feel comfortable riding bicycles on the job. The same way “Cop Rock” ensured we no longer see cops singing and dancing. Wow! This is a travesty. That officer is blocking two lanes of pedestrian traffic and one lane of bike traffic thus forcing what should be four lanes into one. He is forcing pedestrians and bicyclists into conflict with one another. And he is forcing eastbound and westbound travelers into conflict with one another. Can you imagine an officer saying that motorists were speeding so that is why he parked to block off 75% of a road and force oncoming motorists into other oncoming motorists??!? This would never happen. But this is what the police do to bicyclists and pedestrians. I think anyone who witnesses this (or anything else improper) should call 311. Report that the officer is creating a dangerous condition. This will get referred to the local precinct to deal with (or not as they choose). You can also make an “agency complaint” on 311 and report the police precinct for creating a dangerous condition, for blocking dedicated infrastructure, for selective enforcement, for witnessing but ignoring law-breaking motorists who are speeding and running red lights. This “agency complaint” goes to the head of the NYPD. You can also make a “letter to the mayor” on 311. With one call you can do all three: report the problem, make the agency complaint about the police, and notify the mayor’s office of what is going on. what exactly is the speed limit? This is an overreach, and frankly, it’s illegal. By law, the NYPD is authorized to block travel lanes for two purposes: 1) to direct traffic, and 2) to respond to an emergency. The officer was not directing traffic, and there was no emergency situation, so neither applies. Law enforcement officers are not professional traffic engineers. If the location requires a geometric change for traffic calming purposes, that authority is clearly vested with DOT. HEY NYPD! Don’t be a JERK! That’s like the time the off-duty cop buzzed me heading north on centre street. When I caught up to him (mind you he missed me by cm’s) I was like, WTF MAN!!!!! and he was like, you should ride on the side of the road where it’s safer. Like, thanks man, that stretch of Centre street has a really bad door zone, so, you have to take the lane. What would’ve been really safe if the off-duty cop wasn’t such an a–hole. It’s not like I cost him any time. But that stretch of Centre Street, sees cars fly for 4 blocks, b/c they can make 4 lights in a row, only to have to stop again. Windshield perspective is the worst. You know, the NYPD has been around since 1845. I think 166 years is a good run. It might be time to put the entire organization out of its misery. We’ve got to keep showing the illegal behavior of the NYPD in the media. Also try reporting complaints with photos, car numbers, and description of the officer to IAB. They can’t get away with breaking the law forever if the citizenry doesn’t stand for it. Whatever. I ride the bridge every morning and this poses no problem. When I went up the bridge last night, this guy was at a 90deg angle to the roadway, blocking the entire bridge approach. Myself and three other dudes, coming from Suffolk, had to ease south into BQE-bound traffic (doing an actual 40mph) to reach the bridge. Nobody was in the car, the engine was cut, and the emergency lights were on. If I had slightly larger balls, I’d request license plate for my car F-DA-50. yah, I saw that last night. There have been a lot of cop cars parked all over the Bk bound approach to the WillyB lately. Your tax dollars at hard work. When you see something like that, call 311 and report it. Like The Truth wrote: “it’s illegal. By law, the NYPD is authorized to block travel lanes for two purposes: 1) to direct traffic, and 2) to respond to an emergency.” You can do three things through a single 311 call: report it and let them send it to the relevant police precinct, make an “agency complaint” against the police department (this goes to someone higher in the NYPD), and send that same complaint as a “letter to the mayor”. Also, you can try reporting it to Internal Affairs as The Truth suggested. Well I have to give the naysayers credit: the police seem to have botched the bike behavior crackdown as predicted. They really need a squad of dedicated cops who spend part of the day on bicycles to do it right. Cops who volunteer for the assignment, and aren’t just out to hit their quota so they can go back to their real job. The guys and gals on bike duty are probably being punished for something. UGH. They’ve also barricaded the approach with all those barrels. I ride a big loop frame bike with panniers and I had to get off to go through. Not a big deal in the scheme of things, but not very friendly, either. I was also slow-speed followed by cops for a while on Berry Street in Williamsburg. When I stopped at a red light they were looking at me and so I asked them if there was a problem and one said “oh no, sweetheart.” I took out my phone to take a photo of their car number and then they gunned it through the light and sped away. I am so fed up. Perhaps DOT should have a professional engineer advice the precinct in writing that they are creating a hazardous condition. That should clear up the matter. If it does not, it would make appropriate fodder for the dailies. Perhaps it’s now time to start using CCRB complaints. This kind of behavior creates a dangerous situation. There’s photographic evidence of police misconduct, and whether it’s after a specific officer, or simply putting the precinct on notice, it should be done. Simple: Bloomberg, fire this guy, or quit yourself. Also, you can call the precinct directly. It’s on the car. I have had success with that in such instances. I no longer have any faith at all that getting cops on bikes will do anything to cops’ attitude about cyclists. Just about every time I’ve seen cops actually riding bikes in NYC in the past several years, they’re breaking traffic laws as much as any messenger/delivery guy you could imagine. And this is never while they appear to be responding to any emergency. They’re just cruising around. I used to talk about getting more cops on bikes as if it were a panacea for all bike/nypd problems but now I think it would do nothing. Sure, I think there’s a host of reasons that it would be better for the city in general to replace a lot of NYPD cars with pairs of boots, or, sure, even bikes, but not because the latter would make cops more sympathetic to bicyclists. Cops routinely ride around in cars, but that hasn’t made them sympathetic to drivers. Ask around, and there are stories about drivers getting tickets and getting harrassed or arrested that are just as egregious as the things they are doing to bike riders now. Getting cops on bikes sounds like it would help, but in reality I don’t see much evidence that this would change anything in. The real problem is the relationshipo between the police department and everyone else. Simply put, the police in this city are quasi-criminal thugs (sometimes not even quasi) with a profound lack of respect for the citizens. This attitude runs all the way up to the top; it is not a case of a few bad individuals. There are seldom any consequences for the police when they engage in activity that is ilegal or corrupt. Bicycle riders are now on the NYPD radar, joining all kinds of other people who fall into the category of not powerful enough for the cops to fear. In the rare cases where the cops have mistakenly exercised their power against someone who is wealthy or politically connected enough to retaliate against them, they have been quick to apologize. In every other case, they do not car. Cyclists = the new black. People, that is. I’m not sure why but, like you said, we’re now on their radar. My guess is it’s for the same reason we’re on the right wing’s and the mainstream media’s radar. Maybe cyclists are being targeted and scapegoated because we represent some sort of threat. While the ruling class is busy nailing down as much of the world’s oil as they can and “cutting the fat” (aka, destroying all social programs) they’re trying to cash in as much as possible on the last remaining oil by selling the teeming masses cars and gas. That’s not going to happen if the we all decide en mass to ditch our cars. Obviously, anti-biker backlash is fear-induced, but I don’t fully see why. Some it is just entitlement, like PPW. It could be the automobile-centric norms driving Koch Bros.-funded teabaggery have penetrated NYC’s urban upper middle class and upper class too. It doesn’t make much sense otherwise, since NYC’s political elite isn’t based on oil fortunes, although oil does play a part. And then classic attitudes about urban planning come into play; here are people having healthy fun in public, the thing the Robert Moses-style liberal reformers spent much of the 20th century trying to stamp out with urban renewal, highways, and suburbanization. I don’t think blacks v. bikers is a fair comparison though. Blacks are searched and frisked because they’re black, not because they engage in a certain activity. Bikers are often actually doing something wrong when they’re ticketed, but the rules are applied to them more harshly than people from the same socioeconomic background who choose not to bike. When you a ride a bike in the city, you are expected to follow rules that place you at risk and at a disadvantage because they were created by and for the car drivers. But the drivers and most of the law-makers and enforcement claim it is only fiar that you follow the same rules … that you are asking for special treatment if you don’t. You become a target for harassment by law enforcement, and have little recourse against any offenses they may commit against you. But there is a big difference — you can get off your bike at any time and lose this stigma. I’m dubious of the cop’s claim of cyclists going 40 mph down the ramp. For starters, it’s already leveling off where the police cruiser is parked. Second, no sane cyclist who might by chance hit 40 mph further up the ramp is going to continue at that speed into a situation where they enter an area full of pedestrians. Self preservation dictates that they would slow to 15 or 20 by the end of the ramp. Third, I’m reasonably sure the downgrade doesn’t exceed 5%. Plugging some reasonable numbers into a cycling speed/power calculator, I’m getting speeds closer to 27 to 35 mph by varying power level from zero (coasting) to a Lance-Armstrong-like 500 watts, with around 32-33 mph probably being “typical” for someone who continues to pedal at a vigorous but sustainable pace of around 300 watts. 40 mph would require around 1000 watts, a level which only pros can put out for several seconds. Bikes are small, so they generally look like they’re going a lot faster than they are. 25 mph looks like 40 mph to a layperson. In any case, this is another waste of police manpower in a time when violent crime in all categories is rising. Some DOT employee is going to get a stern talking to when Polly Trottenberg clicks on this story.